Most locals who enjoy history know that Frederick has played host or home to some of America’s most renowned past and present leaders including: George Washington, Benjamin Franklin, Abraham Lincoln, Confederate Generals Stonewall Jackson and J.E.B. Stuart, Roger Brooke Taney, Francis Scott Key and more. 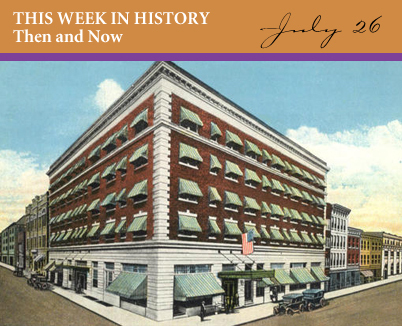 On July 26, 1933, patrons dining at the Francis Scott Key Hotel (located at the corner of West Patrick and North Court Street) were probably a surprised to see First Lady Eleanor Roosevelt ordering from the menu. Motoring to Washington, DC from New York, she and her secretary stopped at the FSK for dinner, then the finest and most upscale hostelry and restaurant in Frederick County. Equally notable is the fact that – according to accounts – she had no secret service personnel in tow. What a simpler time. The FSK Hotel closed in the mid 1970s and served as a nursing facility for some 25 years before being adapted, primarily, for residential and commercial use. Much of the basement level of the building serves as the home of wonderful Maryland Ensemble Theatre. This weekend, Laugh Station returns with their latest installment of sci-fi comedy series. Discover history-making events that occurred in Frederick throughout time, every day of the year with John Ashbury’s “…and all our yesterdays – A Chronicle of Frederick County, Maryland,” an amazing and entertaining book available that can be purchased at the Historical Society of Frederick County. If you enjoy Frederick history, you must have it. It also makes for a great gift.